The real secret? Is to NEVER STOP going for what you want. Develop tenacity. Decide you WILL see this through no matter what it takes. Decide that you will weather the tough times. Decide that you will not quit. Decide that you won’t make excuses. Decide that you won’t turn down another opportunity because it requires a bit of work. Decide that when you feel like giving up, you won’t. Decide that in your darkest hour, in the middle of the night, when you goals seem so far away, you will rise up to the challenge the next day and take another step forward. There’s a saying that to have the things that most people don’t have you have to do the things that most people won’t do. Be that rare breed that triumphs. Don’t think that there isn’t enough in the world for you to have exactly what you want – there is more than enough. No-one is going to go without because you are going for MORE. Don’t worry about the competition – NO-ONE does things like you do! Your job every day is to show up and be you. The rest of it, your work, your money, your social media strategies, your marketing, your products, your passions, all should come from you being YOU and not from you conforming to what other people expect, or want or say you should be or do. Stand up for yourself. I don’t mean in a conflicting, argumentative way. I mean take a stand for who you are and what you want. Take up YOUR space in the world. Don’t shrink and play it small – there are no rewards there, only regrets. 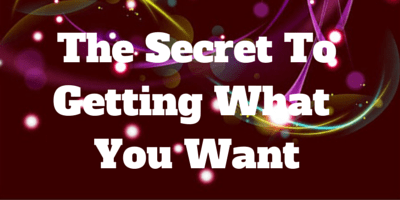 You are as ready as you are ever going to be to really go for what it is you want to do. People avoid going for what they want as it requires effort, and discomfort, and bravery. Going for what you want, the life you want to create, the work that you want to do, I mean REALLY going for what your heart desires, can be pretty scary. You have to get used to dealing with fear; in fact if you don’t feel some fear nearly every day at some level, you probably aren’t going full out for what you want and you are just going through the motions in that nice comfort zone of yours. We’ve been taught that we have to have everything planned out before we start; to have all the ducks lined up in a row, or whatever the phrase is. That’s NOT the case. You just have to go with your feelings and take that one step forward, and another and another…. THAT’S IT! Don’t get sucked in by having ‘security’. You can’t have job security, that’s for sure. If you are working for someone else, you just have the illusion of security. The only real ‘100% safety and security’ you have is being 100% YOU in everything you do. If you aren’t already, start to create your own money even if you have a job. You can absolutely create your own income from your ideas and passions. They say the final mile is less crowded. Only the tough can stick it out that long and that far. Only those with incredible tenacity will really go full out to create their business and life on their terms; truly on their terms. See you at the final mile? PS. I’d love to help you on your journey to the final mile. If you can relate my this blog post and want a way to work with me then you need to check this out! 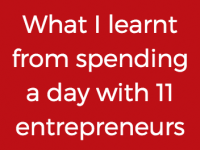 For the next 24 hours (8pm GMT Thurs 18th Sept) you can get Instant Access to the ENTIRE contents of the Big Daring Business Academy for just $97 ($738 value). 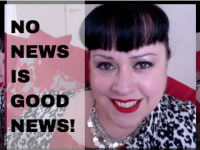 No news is really good news! This is how we spend our lives!